The Canal Latéral à la Loire runs for 196 kilometers between Briare at its northern end and Digoin in the south. The canal is part of a system of navigable rivers and canals joining the North Sea and Atlantic Ocean to the Mediterranean Sea through the center of France. Here is the story of two one-week trips from Briare to Decize in a rented canal boat, covering 130 kilometers and passing through 23 locks for an elevation gain of 54.2 meters. 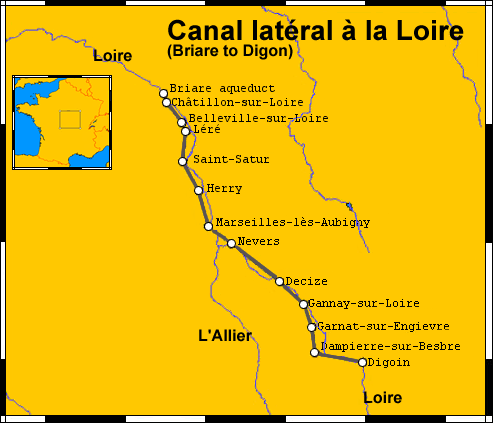 The Canal Latéral à la Loire was built between 1827 and 1838, providing a much more reliable shipping route than the River Loire itself. At its north end in the town of Briare it connects to the Briare Canal, which runs 57 kilometers north and connects to the Canal du Loing and through that to the River Seine. The Briare Canal was built between 1604 and 1642, making it one of the oldest canals in France. At its south end the Canal Latéral à la Loire connects to the Canal du Centre, which leads to the River Saône. The Saône joins the River Rhône, which empties into the Mediterranean. The Canal Latéral à la Loire is thus a central link in a series of navigable rivers and canals connecting the North Sea and Atlantic Ocean to the Mediterranean Sea through France. A large canal bridge was opened at Briare in 1896. Boats previously locked down to the Loire and crossed the river between a pair of dikes. Until 2003 the Briare canal bridge was the longest navigable steel aqueduct or canal bridge in the world. We will cross another large canal bridge over the Allier river at Guétin, and several small canal bridges. Part of Tactical Pilotage Chart F-1B from the Perry Castañeda Library Map Collection at the University of Texas. The Freycinet gauge is a standard governing the dimensions of canals and especially their locks. The standard dates to 1879, when Charles de Freycinet was the minister of public works in France. The law required that lock chamber dimensions and bridge clearances be increased to at least the new minimums, allowing barges of 300 to 350 tonnes to pass through. Lock chambers must be at least 39 meters long, 5.2 meters wide, and 2.2 meter minimum water depth. Bridge clearance must be at least 3.7 meters above the waterline. Vessel maximum dimensions are 38.5 meter length, 5.05 meter breadth, and 1.8 meter draft. 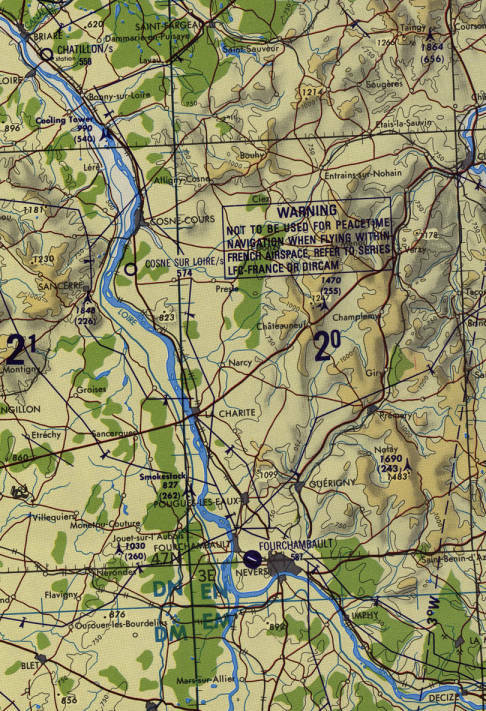 We will leave Briare and pass these towns, stopping to explore several of them in addition to those where we will tie up overnight: Saint-Firmin-sur-Loire, Châtillon-sur-Loire, Beaulieu-sur-Loire, Belleville-sur-Loire, Sury-près-Léré, Léré, Boulleret, Bannay, Saint-Thibault-sur-Loire, Saint-Satur, Sancerre, Ménétréol-sous-Sancerre, Thauvenay, Saint-Bouize, Herry, La Chapelle-Montlinard, Argenvières, Saint-Léger-le-Petit, Beffes, Marseilles-lès-Aubigny, Jouet-sur-l'Aubois, Cours-les-Barres, Cuffy, Gimouille, Challuy, Nevers, Sermoise-sur-Loire, Chevenon, Luthenay-Uxeloup, Fleury-sur-Loire, Avril-sur-Loire, and Decize. The canal still carries commercial traffic. The most important ports along the way are Briare, near Boulleret, Saint-Satur, La Chapelle-Montlinard, Marseilles-lès-Aubigny, Nevers, and Decize. Our start and end points of Briare and Decize have populations of 5,760 and 5,771, respectively. Nevers is by far the largest city along the route, with a population around 35,300. La Charité-sur-Loire is the next largest town along the route, at 5,460. Other than those, the towns are small and the canal mostly passes through rich agricultural land. The pictures and descriptions here are composites of two trips, the first in 2005 and the second in 2012.